DF™ Cheat Analyzer traffic anti-cheat system. The system allows detecting traffic cheats and evaluating the traffic quality from multiple sources (traders). The system is meant for webmasters who trade traffic through certain systems (CJ/TOP), or webmasters who purchase traffic for their sites. This system is intended for webmasters who have got traffic or, to be more precise, for webmasters getting traffic from other users. If this applies to you, then you are the one this system is intended for! It doesn't matter how you get that traffic — you may be purchasing it or trading it with different webmasters by means of various scripts (CJ/Top) — what matters is the fact that you are most probably getting cheated! This system allows fighting most of today's traffic cheats. It gathers and analyzes information by over 30 traffic parameters and uses a number of unique algorithms in the process of revealing possible traffic cheats. With the help of this system you will be able to bust cheaters with no sweat, which will help you increase the quality of your traffic and, possibly, save quite some money. At the moment we are working to improve the rate of revelation of traffic generated by means of botnets. The system offers detailed statistics including more than 30 characteristics of the traffic (hits, unique hits, clicks, proxies, cookies, scripts, frames, etc) for different time intervals (by day, during the past 24 hours). The system counts ALL traffic (page loads) no matter if the surfer uses or doesn't use scripts in his browser or if he/she is viewing pics or not (99% of all traffic counters including Analytics.Google.com, ExtremeTracking.Com, Masterstats.com depend on this parameter). The system may perform the function of a traffic counter at the site. The system gets installed to the user's site. The system is written in C++ and having minor hosting requirements, not used: MySQL, cron, Perl, Php etc. System counter code is placed at the site's pages with the help of SSI (PHP/Perl). System counter is compatible with most CJ scripts and some of the TOP scripts (DF TopList Pro/Lite, GB Top-Directory). *Those who want to install the system over AutoRank Pro/PHP toplists will have to modernize their toplists slightly. Full system installation manual is available in the documentation section. A counter of DF™ Cheat Analyzer is installed on the site which receives the traffic. Employing special algorithms, the system collects information about the traffic being sent (over 30 parameters), and distributes traffic according to its sources (sites or trades). Then, the system analyzes the data obtained and gives its evaluation of traffic from every source, taking into account he importance of every traffic parameter, and total traffic amount. It results in three values: cheat value, difference value, and quality value (the administrator can set custom factors to influence the calculation of traffic parameters). Comparing these parameters, one can easily see the differences and determine the overall value of traffic being sent from this or that source. Also, detailed statistics per every traffic source is available, with values highlighted according to the difference between actual traffic parameters and values set up by the administrator. The system accumulates and analyzes over 30 traffic parameters (Raw, Uniq, Load, NAProxy, AProxy, Cookie, JS, ActiveXNew (there's a possibility to turn off use of ActiveX), Frame, GeoIP...).Frames are detected, a proxy list is used along with lists of unwanted countries and languages. Identification of surfers by computer ID is applied New!. Scanning not anonymous proxy servers is made (search of duplicates real IP). Also, some advanced mechanisms are available meant to work with different browsers, which allow detecting artificially generated traffic with a high degree of reliability. Clicks analysis: calculation of the total number of clicks, exposure of quick clicks, calculation of traffic productivity.New! Statistics by day (today, a specified number of days). All statistics is displayed in realtime mode. The feature allowing analysis of traffic at several sites located at one and the same server.New! 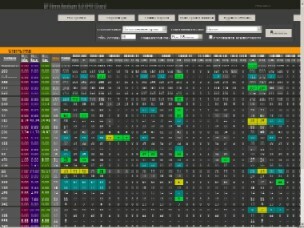 The feature allowing grouping of traders and showing statistics by group. One group can include traders from one site (in case there are several sites connected to one system) or different sites belonging to one and the same user (in case the user has one account in a third-party system and several sites from which he's sending traffic).New! Allowing you to create users in order to view statistics. The system counts all the page loads for the page where the counter is placed (SSI, PHP, Perl), unlike other systems which depend on page code and counter image (Analytics.Google.com, ExtremeTracking.Com, PayCounter.com, Masterstats.com, SexTracker.com). The system's counter can be placed to the pages of CJ/TOP to analyze trade traffic. This allows analyzing the traffic of every trade and spot artificial traffic. A manual is available covering setting up the system to work with toplists powered by DF TopList Pro/Lite. System time does not depend on server time and can be modified by the administrator. System time does not change when moving servers. The entire system is written in C++ and shows great performance results, having relatively minor hosting requirements. No MySQL, cron, Perl, Php etc are used. buffer is used in data reading;New! the use of multithreaded calculation in the process of calculating statistics.New! The feature allowing the use of internal or server scheduler (cron) for rotation of statistics.New! The system has several models different in their prices and functionality. The difference between models lies in the maximum amount of traffic processed by the system daily. If there is more traffic than specified, some trades won't be shown in the stats. The price of the first month of rent. Аnalysis of traffic at several sites located at one and the same server. Now you can buy one copy of the system and use it to analyze traffic on all sites located at your server. Trial version has all the functionality of the commercial version DF™ Cheat Analyzer, but it will expire 20 days after the installation. The cheat value — shows the percentage of bad traffic for a trade. This is influenced by trader attempts to cheat the system sending artificially generated traffic. The difference value — shows how different is the trade traffic from the system traffic. This is calculated using average system traffic parameters. The quality value — shows the quality, or 'overall value' of the system traffic. This is calculated basing on traffic parameters deemed to be near-ideal.